Recorded in Japan, Poland, Brazil, the USA, and Italy, the Wolf's Rain soundtrack represents a standard of diversity we've all come to expect from composer Yoko Kanno. While Kanno wrote and arranged all of the music for the album, vocalists Steve Conte (the voice behind quite a few of the best Cowboy Bebop tunes), Joyce, Raj Ramayya, Ilaria Graziano, and the excellent Maaya Sakamoto (perhaps most recently heard in Rahxephon, though she's extremely prolific) all help round out the international flavor of this excellent disc. The full-length version of "Stray" starts the disc, setting the mood for the album as well as it does for the show. Steve Conte's voice is good at eliciting a feeling of melancholy while simultaneously providing a hint of hope for the future, which matches up precisely with the overall tone of the series. The instrumental tracks that follow are easily as good as anything James Horner has composed, and I bring him up in particular because the emotional content of the compositions remind me of the music from Bravehart. The violins and horns in the songs evoke feelings of sorrow and loss with a strong inner core that, yet again, mirrors the tone of the show perfectly. After a brief instrumental interlude, Joyce performs "Dogs and Angels", and then Raj Ramayya provides vocals for "Strangers". Ramayya's voice is silky, though the song is a bit pop-ish in nature. Carlos Maltra's solo on the "ethnic flute" is a good midway point for the album, with its reflective sound. The Warsaw Philharmonic Orchestra provides the music on tracks 11 and 12, "Tip Toe Waltz" and "My Little Flower", and their classical tone rounds out this album. "Could You Bite the Hand?" is an acoustic song performed entirely by Steve Conte, and its message is one that many people could stand to listen to nowadays. Conte is fast and furious on the guitar, and it's nice to see him add some more entertaining songs to his already impressive portfolio. Following that English-language song is "Valse de la Lune", which is, not surprisingly, in French. Ilaria Graziano takes her turn in providing the vocals for this one, a peppy waltz with some engaging percussion sounds backing it up. And then we have a few more instrumentals. "Hot Dog Wolf" and "Silver River" both primarily feature the acoustic guitar, and then they lead in to the more epic-sounding "Sold Your Soul". "Visions of a Flame" sounds more like a Native American tribal song (which really, it is supposed to be), and while it may not be the most acoustically pleasant, it again displays Kanno's mind boggling range of compositions. Joyce provides vocals once more on "Run, Wolf Warrior, Run". While it was recorded in Rio de Janeiro, the song sounds more like a folk song from America's 60's. The lyrics are surprisingly solid in English, considering I don't usually expect English-language songs composed by Japanese writers to make sense. 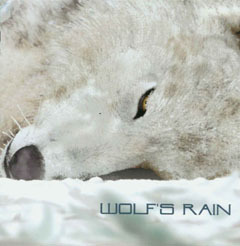 The final vocal track on the album is Maaya Sakamoto's heart-wrenching "Gravity", Wolf's Rain's end theme. While her Japanese accent is obvious in English, she has a powerful, soulful voice. Like "Stray", this is the full version of the song instead of the truncated TV Edit, and the extra length adds to the beauty of the tender song. It's one of those songs that can bring a tear to the eye in the right situation, and while I enjoy the fun songs that Yoko Kanno can create, tunes like this really show her skills as both composer and pianist. Track 21, "Paradiso", is the final track on the disc. Somewhat wistful, and certainly lighter than most of the other tracks on the album, its driven mostly by piano and clarinet, and finishes the album with dignity. It can be hard at times to judge a disc without seeing much of the show that it was created for, but Yoko Kanno's music is always a treat to hear. While I'll most certainly watch the rest of Wolf's Rain as it's released over here, I'm glad that I've had the opportunity to hear this wonderful soundtrack as a domestic release. The translations are solid, though I do wish the lyrics for every non-English song were translated alongside their original transcription. My French isn't too solid, and my Portuguese comes entirely from my limited experience with Spanish. Plus, I hate translating stuff. Still, just having this soundtrack in my hands is gift enough from Bandai, and while I love the little plush Kiba that the deluxe DVD release came with, this CD is one of the best extras I can think of. If you missed out on the special edition release of the first volume of Wolf's Rain, you really need to get this soundtrack. Any fan of Yoko Kanno will be pleased, as we usually are when she produces a new album. It's even better when the disc is free (from what I can tell) of the kind of technical faux paus that the Stand Alone Complex disc fell prey to.